Restore your deck's beauty and protect it for years to come with Everseal's professional deck staining service. Not only will your deck look great, but it will be protected from the elements to ensure that your deck will last for many years. The expert deck stainers at Everseal are Wolman certified, highly-trained, and use only the highest-quality products available. While having your deck refinished may seem like a daunting task, the pros at Everseal remove the headaches from the deck staining process! The process begins with our no-cost, hassle-free estimate: one of our friendly and helpful team members will meet with you to visually inspect your deck in order to determine the exact requirements of your project. Next up is selecting the color, as well as the best product to apply to your deck, whether that is a transparent stain, a semi-transparent stain, or a solid stain. We will walk you through the decision-making process to ensure we select the best type of product for your particular deck. 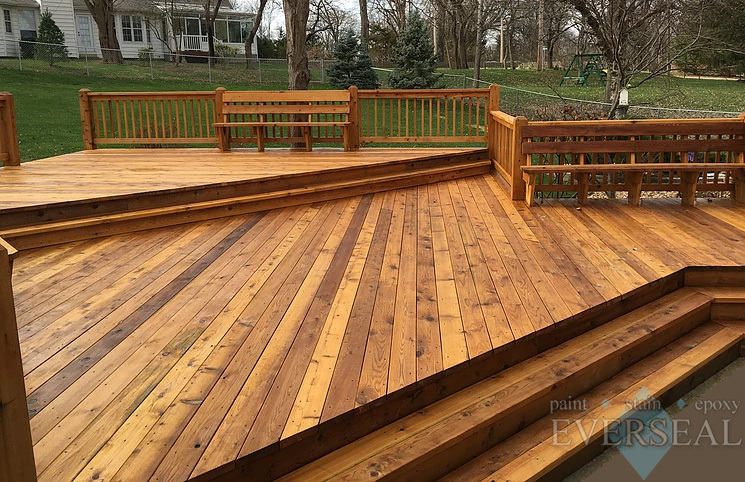 Once the details of the project are fully planned, it's time for the professional deck staining team from Everseal to get to work! When the work begins, the first step is to properly clean your deck using professional cleaning products. When the deck is clean, we must let it thoroughly dry before we apply the stain. After drying, we send out our expert deck stainers, who will ensure all plants and other surfaces are fully protected before they properly apply the stain to your deck, renewing it's original beauty and keeping it protected for years to come! Once the staining process is finished, our team does a thorough cleanup of the area to make sure we are leaving your deck and surrounding area looking its best! Why are we the best Deck Staining Service in St Louis? One of the most important aspects of completing a deck staining project is choosing a quality deck staining contractor. 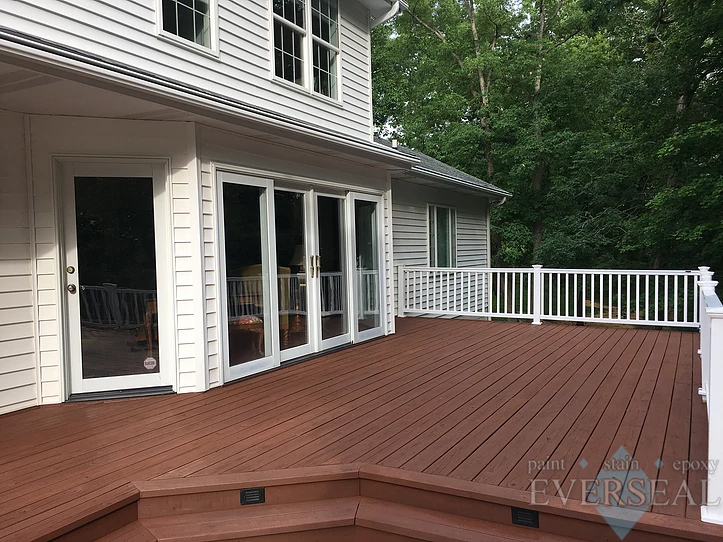 When you choose Everseal to refinish your deck, you get a hassle-free process with excellent results. Deck staining from Everseal is both convenient and affordable. We are Wolman Certified, and we specialize in the proper preparation and application of stains and hardwood oils. We have the expertise and manpower to tackle any deck staining projects! Serving the area since 2004, Everseal is the premier contractor for deck staining in St Louis! We have helped hundreds of local residents restore their deck's great looks, and we are recommended by some of the largest deck builders in St Louis! We would love to have the opportunity to help with your deck staining project! Please fill out the form below for a free estimate, and we will get back to you as quickly as possible.